Let’s say you have an enzyme. It has an active site, a known substrate, and all that jazz. If you know the activity assay for this enzyme, you can design experiments aimed at inhibitors by measuring substrate turnover. 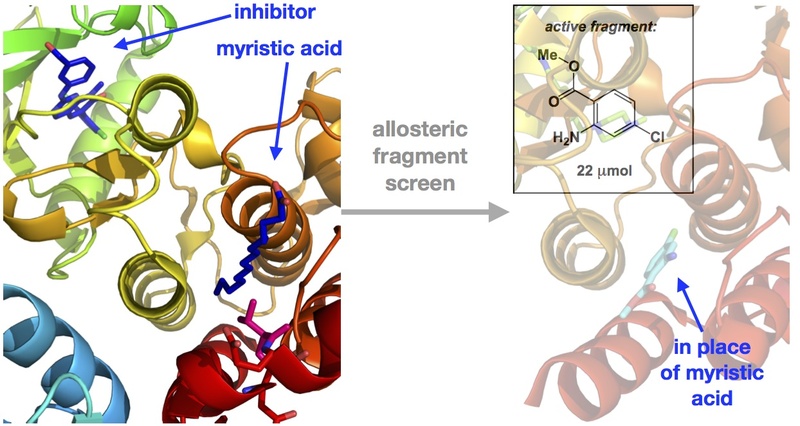 While plenty of tools for targeting competitive active site inhibitors (both covalent and non-covalent) exist, the situation is much bleaker for the so-called allosteric inhibitors. These are in a league of their own as they bind some place other than the active site. Identifying allosteric sites and designing inhibitors that bind there is an interesting undertaking. Earlier today I attended a talk here at the University of Toronto by Wolfgang Jahnke of Novartis, Switzerland. The gist of one of his projects is described in the JACS paper I want to talk about tonight. In it, Jahnke and colleagues interrogated the allosteric site of Bcr-Abl kinase. Myristic acid is the natural ligand for this site (see below – I have made these images using PyMol). As it turns out, there are two possible conformations. When myristic acid binds, one of the helices gets bent (shown). Without myristic acid, the helix is unstructured. The authors designed a clever NMR assay: they first prepared the kinase labeled with 15N at Val525 (see the pinkish “V” underneath the myristic acid molecule?). When myristic acid is bound to the enzyme, Val525 is structured and gives a weak signal in the 15N/1H HSQC spectrum, whereas the unbound state is characterized by a strong Val525 signal. With this in hand, the Novartis team developed an assay in which they added a known inhibitor first (PD166326 was one of them, identified as “inhibitor” in the graphic below). The role of this molecule is to bind in a canonical fashion (at the ATP site) and stabilize the inactive kinase conformation. Subsequently, the authors screened small molecule fragments, monitoring Val525 HSQC peak. The “hits” were molecules that weakened the Val signal. This is a beautiful experiment that enabled the authors to discover fragments that acted in concert with PD166326 (one of them is shown on the right hand side of the graphic below). Given the fact that point mutation is the main mechanism of resistance to ATP-competitive kinase inhibitors, you can see the benefits of this approach to overcome resistance against current Bcr-Abl inhibitors. Administered in concert, cocktails might represent a compelling therapeutic approach to battle cancer. I loved the fundamental science that has gone into assay development here. Incidentally, one of these combinations apparently goes into phase II next week. Good luck, Novartis!